The Woodchat Telephone Design Game works like any telephone game. Each participant takes something from the previous participate, make intentional or unintentional changes and then passes it along to the next participant. Instead of using silly phrases, +Woodchat is using a furniture design. 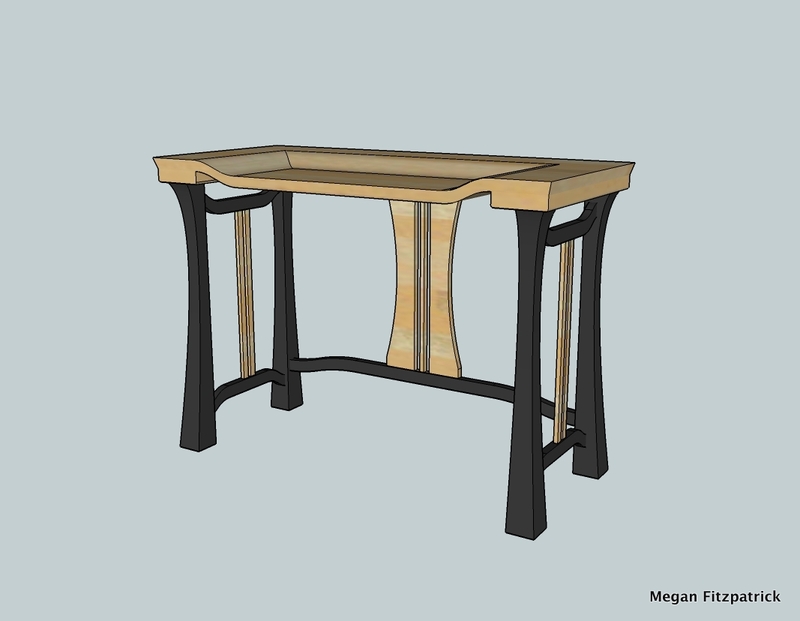 The design started with this piece by +Chris Wong of Flair Woodworks. Chris Wong's Telephone Design Game Design. The design version before mine (design version #6) was by +Megan Fitzpatrick. This was her design. Megan Fitzpatrick's Telephone Design Game Design. 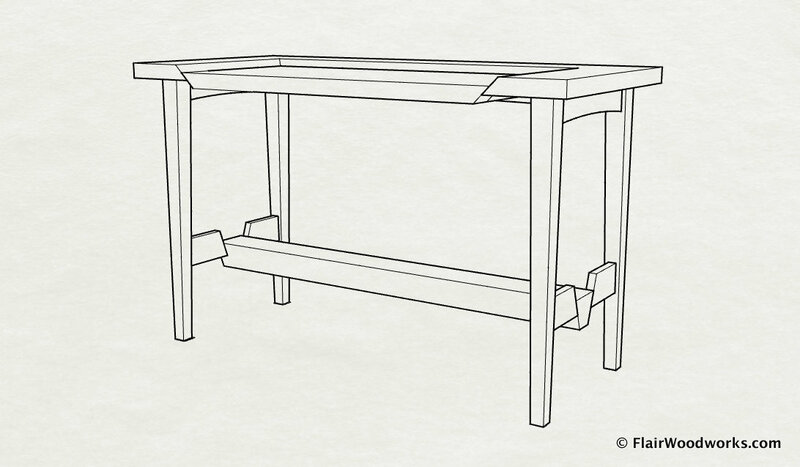 I really liked the center, lowered section of what I’ll call the desk surface (though to be true to the Telephone Design Game guidelines, it should only be called furniture). I felt this really complimented the curved legs and the cloud lifted stretchers. My least favorite part of the previous design was the hard edge along the outside of the desk surface. I felt that the juxtaposition of this hard edge against the soft curves of the lowered center and stretchers left the piece unsettled. The outside edge was the first design component I changed. 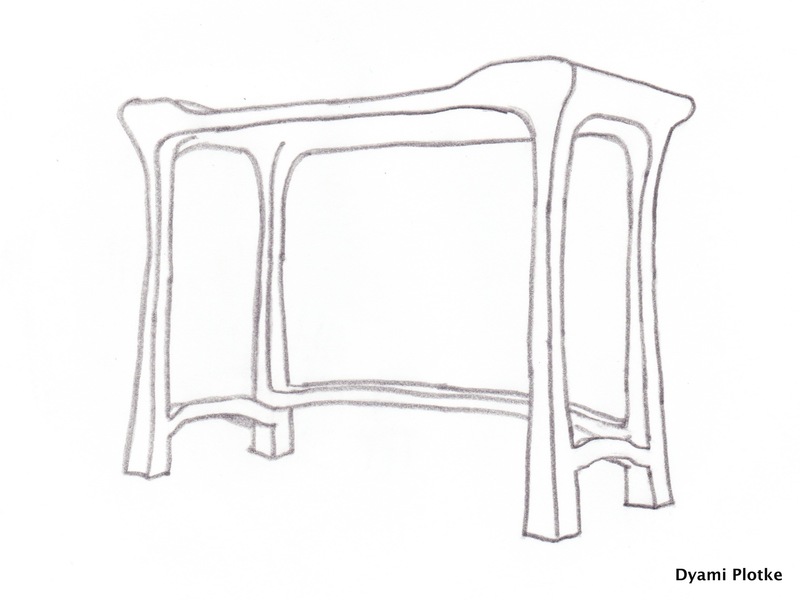 Wanting to tie curves of the desk surface, legs and stretchers together, I eliminated the hard outside edge and instead worked to sculpted the top surface around and into the legs. I felt this brought a more harmonious composition to the design. I carried that curve down the leg, following the same splay which was in the previous design. At the bottom of the legs I felt the cloud lifted stretchers tied in nicely. At the top the stretchers seemed awkward and unnecessary against my new curved and flared leg to top joint. I removed the top stretchers. Next, I tried to flair the vertical ornamentation which ran between the stretchers in the previous design. I tried this a few times, and each time the flared transition into the stretcher was big and awkward. I finally decided to eliminate the the vertical ornamentation and leave the desk in what I felt was a cleaner state. Sometimes the absence of material is just as important to a design as the presence of material. I’m happy with the way the desk came out. While I didn't initially have too much attachment to the design, after discussing it on Woodchat last week it has grown on me. While I can’t say it’ll be soon, I think I’d like to make this desk some day.